Herewith Springtime Bandit. 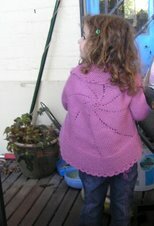 It's really a rosy pink, done in some Bendigo Aran I had leftover. I used 5.5 mm needles. I'm more pleased with it now off the needles than I was when knitting it. It didn't really excite me as I did it. The first two charts were clear and simple, although I re-graphed the stitches after the first chart to show the actual stitches from the double increase done by knitting front and back of the stitch and also using a yarnover between those two stitches. The last chart, the final 34 rows was, for my eyes anyway, messy and hard to read. Now I realise that was because of the number of stitches and rows. I would have preferred to have seen the chart split into two charts. That way, the squares for the graph could have been larger and much easier to read and use. I found this a boring knit. I can't quite say why but it didn't really inspire me at all. It's definitely warm, being Aran weight, but it was boring. I'd do another Milkweed, Aestlight or Ishbel before I even considered a second one of these. This makes the sixth shoulder shawl this year having done two of those mentioned twice already. It may not bother some, but I was peeved by the instructions that it was imperative to check gauge before starting and to adjust needle size if necessary. This is not a garment where fit is essential. It's a shawl to throw over the shoulders, for goodness sake. OK, so who wants it pocket handkerchief size or conversely, the size of a triangular shade sail? But minor differences should be fine. I didn't even measure my tension for this and just guessed from the feel of the fabric which came off the needles whether needles should be a different size. Actually the size of mine is very close overall to the schematic. It's a bit wider across the neck edge and marginally longer down the centre. I had thought it may have been much bigger. The pattern suggests that the skill level required is medium. I would have thought that that level would not need to be told that it is imperative to get the exact tension. Another rant while I'm at it, but on a related topic. I have been a member of Ravelry from the very early stages. I use it as a tool and it's wonderful. It's pretty well the first place I look for patterns now. I'm a member of some forums, although I no longer participate in some of those as I find the tone is quite quickly changed from pleasant to very snarky. Others are good, particularly those associated with a specific designer. I belong to several of those. I don't take part in swaps or much discussion, my queue is for my benefit alone as a means of bookmarking something particularly appealing for my later reference. Nor have I posted pictures of my stash. That said, I could easily spend a great deal of time there and have done so. But again, it's a tool I appreciate. However, another couple of peeves while I'm feeling grouchy. There are 300(!!!) pages of shawl patterns and I've looked at every page. Many of the designs, particularly near the end of those pages, just don't belong there. I don't know if this is a technical problem or mistakes by those uploading patterns. However, I don't class children's jumpers, booties, felted bags and more as shawls. However there are loads of such patterns in amongst the shawls. If a pattern is to be uploaded for all to enjoy, then it's a good idea to show off the finished product to its best. However many shawls and socks are very dark on a dark background. I'm not talking about camera skills here but the actual colour chosen. If something is lacy but dark and shown on dark background, then the lace is hard to see. With 300 pages to look through, I'm not going to spend time on such things. I like patterns for shawls where they are draped or hung so the pattern can be seen. On the same lines, I was amazed how many patterns are there with no picture available. Now if I click on the pattern I may find that others making it have put up a picture of their own which shows the garment. But to me, it's a real turnoff and I usually don't follow up a pattern which has no picture in the index. I can spend enough time on the site without doing that. I'm off tomorrow for a few days in the Southern Highlands. Hopefully I'll be in a better mood when I return. Shoulders and wrists have been aching with the seasonal change and I'm somewhat sleep deprived from that. This morning I was down at the local supermarket just a couple of minutes after they opened at 6:00 am! I'd been awake some hours before then, so that quite possibly explains my poor mod. Still good friends, good food, lovely surroundings and hopefully good weather should help. love this shawl - I am currently knitting it too and agree with your peeves - I am knitting it in 4 ply and did an extra repeat - but you a right - it is a shawl not a fitted garment so gauge is not imperative at all!!!! and as you say a shawl is a shawl not another garment! Well your shawl looks lovely, but it is a bit confusion with such IMPERATIVE instructions. 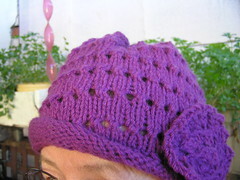 I agree about the photos missing from patterns on The Ravelry: most annoying. I dip in and out, I have a few groups where I keep in contact with people who live right here where I do!! They check their Ravelry more often than their email!!! Imperative? With a shawl? What rot! I'm with you. I think the lack of pictures for some projects is perhaps because there are none available. I ignore those ones and figure some day someone will have knit it and put a picture up and the editors for that pattern will add the photo to the main page. Some projects just don't get made and so no one photographs them!